Apple has devs to the grindstone for a new social networking app called iGroups. Patently Apple reports that docs out today from the US Patent Office describe a new service that would work on your iPhone and probably MobileMe, too. Let’s say you’re attending SXSW: iGroups would keep you in touch with your co-workers and friends by allowing you to share your location plus info and comment on events as they happen, greatly facilitating which parties or events are worth attending or already over. To accomplish this, iGroups reportedly employs a sophisticated cryptographic key generation system to ensure security and privacy. 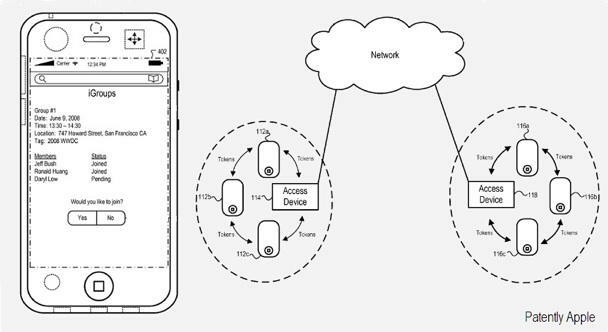 The patent also states that if one of group devices lacks true positioning technology, Apple’s MobileMe service would provide “virtual GPS” capability to that user so they can still know the whereabouts of other group members. Would you welcome a geo-location social networking app from Apple, or prefer to stick to Gowalla or Foursquare? Or do you plan to shun the “Where’s Waldo?” world altogether?